A few days ago, we talked about how the enemy Balearic slingers had devastating effect on the Roman army at the disastrous Battle of Cannae. Well it seems that the ancient Romans not only learned from their mistakes in the previous centuries, but also improvised on the ammunition front by adopting specialized whistling sling bullets during their campaign in Britain. These pellets in question were actually recovered from Burnswark Hill (southwestern Scotland), the very site where Romans pushed forth towards their Scottish foes atop a hill-fort, circa 2nd century AD – at least according to some scholars. While other researchers believe that this area housed an ancient Roman training camp. In any case, one thing is for certain – the location was host to a lot of Roman soldiers and their evolving military equipment. 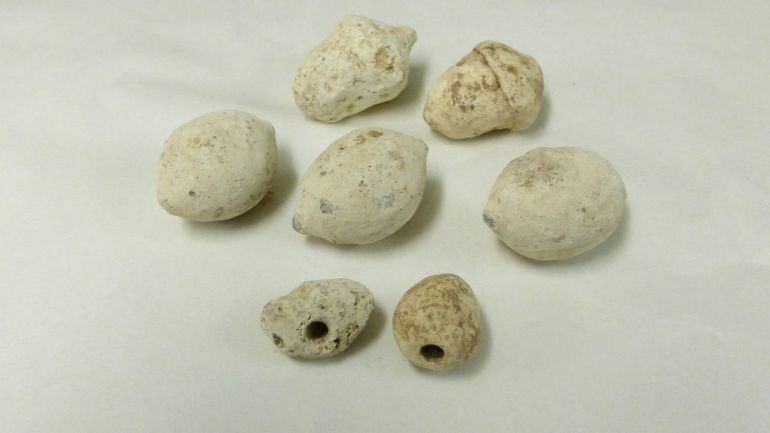 Coming back to these specialized sling bullets, the archaeologists analysed the ‘ammo’ at the Burnswark Hill and found that around 20 percent of them were one-ounce pellets drilled with 0.2 inch holes. From the historical perspective, the typical sling bullet of this period was larger and heavier at 2 ounces – which more-or-less accounted for the remaining 80 percent of the specimens at the Scottish site. Now while the conjecture could be made that these odd holes in the smaller versions were possibly used for holding poison, the tiny gaps are simply too small. Furthermore, the lightweight nature of these ‘dented’ bullets make them inferior in terms of ballistics, especially when compared to their larger counterparts. Such disadvantages would have rendered them ineffective in projectile-based warfare scenarios that entailed throwing poison. You don’t just have these silent but deadly bullets flying over; you’ve got a sound effect coming off them that would keep the defenders’ heads down. Every army likes an edge over its opponents, so this was an ingenious edge on the permutation of sling bullets. Interestingly enough, the smaller nature of these bullets could have also made them useful for scatter-shot tactics. Simply put, multiple pellets could be fitted into a sling made of two cords, and then hurled towards a packed formation of enemies in a single shot. Now of course, such expert slinging actions were not exactly the forte of a typical Roman legionary of 2nd century AD. In that regard, many specific battlefield roles were often fulfilled by the auxiliary troops (auxilia) who accompanied the conventional Roman legions in their far-flung campaigns. Suffice it to say, the Romans were surely impressed by the Balearic slingers of Hannibal, circa late 3rd century BC. So over time, many of their descendants were inducted into the Roman army, including that of Julius Caesar’s army that invaded Britain in 54 BC. And lastly, as for the expertise demonstrated by the auxilia slingers, these Balearic islanders were said to carry three different types of slings into the battle, each for variant ranges. When translated to figures, according to Reid, a heavy version of a sling bullet could reach velocities of over 100 mph – which would have been enough to “literally take off the top of a head”. 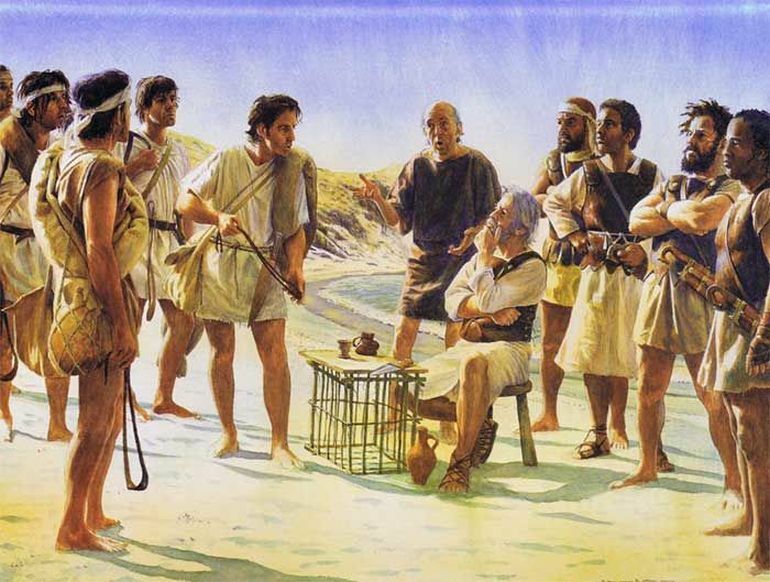 Balearic slingers recruited by Carthage, circa late 3rd century BC.